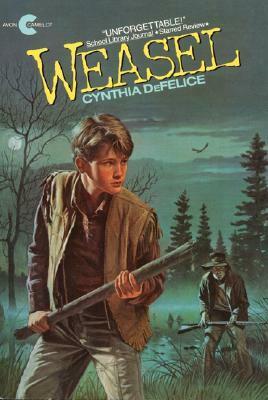 This week's book, Weasel, is set in 1839 Ohio. Nathan and Molly have been waiting for days for their father to return from hunting when a mysterious mute stranger comes to their door carrying their deceased mother's locket. Knowing their father never removes the locket, they realize he must be in danger, so they follow the stranger. As night becomes day, the children learn that Ezra and their father have both been victimized by Weasel, an evil, cold-blooded man who terrorizes many of the local settlers. Ezra lost his tongue and his family years ago, while Nathan and Molly's father has been severely injured and robbed of his gun. As Nathan attempts to take on his father's duties while his injury heals, he, too, comes face to face with Weasel, an encounter which provokes his own surprising emotions of anger and hatred. This is another book I remember from middle school, but I have never read it until now. I know it was popular among other kids in my seventh grade English class, however, and because of that, it was one of the first titles I added to my list for this project. After my recent disappointment with the author's new book, Fort, I was a little concerned that I had made a mistake, but it turns out I had nothing to worry about. Weasel is well-plotted, fast-paced, emotionally charged, and wholly satisfying. The historical details in this book serve mainly as backstory. The reader learns, as the story progresses, that Ezra and Weasel were hired by the government to remove the Shawnee people from their land, and that Weasel's approach was simply to kill the Indians, rather than relocate them. Ezra ultimately realizes this is wrong and begins to embrace a Shawnee way of life, while Weasel becomes more and more bloodthirsty and violent. This information, which is primarily introduced through discussions between Nathan and his father, gives the reader an understanding of the harsh treatment of Indians during this time, and of the ways this cruelty affected not just Indians, but whites as well. Though this is not the primary focus of the story, it provides context, and it gives readers larger issues to ponder alongside Nathan's very personal decision about whether to exact revenge on Weasel. Primarily, though, this is a book I would recommend for entertainment. It's scary, surprising, suspenseful, and short, all qualities which tend to appeal to even the most reluctant readers, and it would also make a great read-aloud, especially since the chapters are only a few pages each. It is similar in many ways to The Lion Who Stole My Arm, and it is likely that readers who have enjoyed that book will enjoy this one, and vice versa. Another read-alike is The Sign of the Beaver by Elizabeth George Speare.